Last week I went to see TOVE JANSSON – ART, LOVE & MOOMINS at the exhibition space Gl. Strand in Copenhagen. 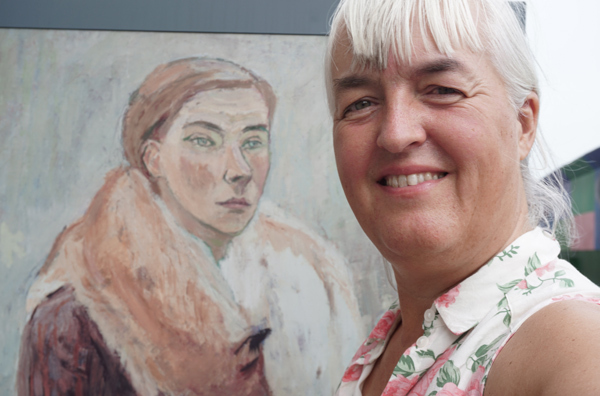 It is a retrospective exhibition about Finish painter, illustrator, author and lesbian Tove Jansson (1914 – 2001). 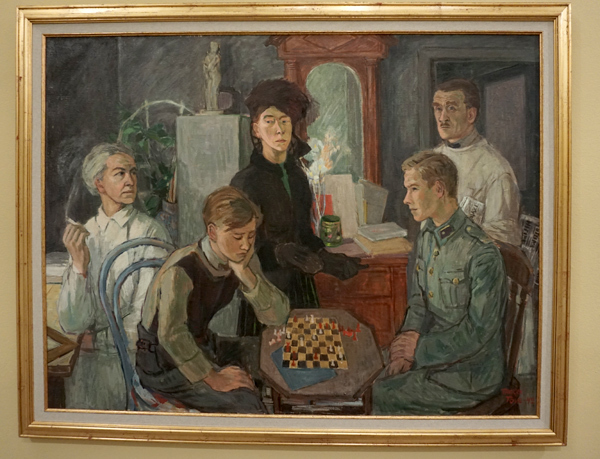 The exhibition features a series of Tove Jansson’s paintings, satirical anti-war illustrations and a great number of her original cartoons and illustrations children’s books. The material emphasises Tove Jansson’s private life (with her family and her wife Tuulikki Pietilä), and in particular her extensive work with the Moomins, in drawings, photographs and documentary films about her life. The exhibition coincides with the Copenhagen Pride and there has been held two guided pride tours of the exhibition. Tove Jansson studied at University College of Arts, Crafts and Design, in Stockholm in 1930–33, the Graphic School of the Finnish Academy of Fine Arts in 1933–1937 and finally at L’École d’Adrien Holy and L’École des Beaux-Arts in Paris in 1938. She displayed a number of artworks in exhibitions during the 30s and early 40s, and her first solo exhibition was held in 1943. Tove Jansson was 25 and living in Finland, when World War II broke out. 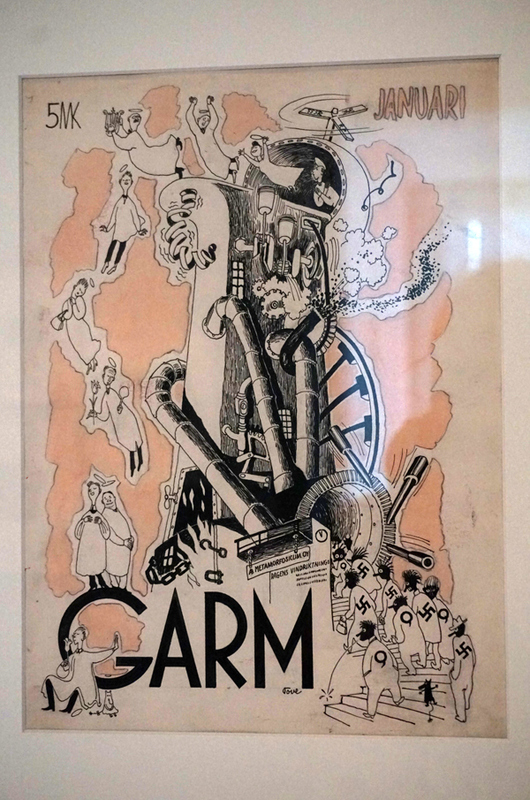 She made illustrations and cover drawings for the Garm Magazine which I found very very humouristic. 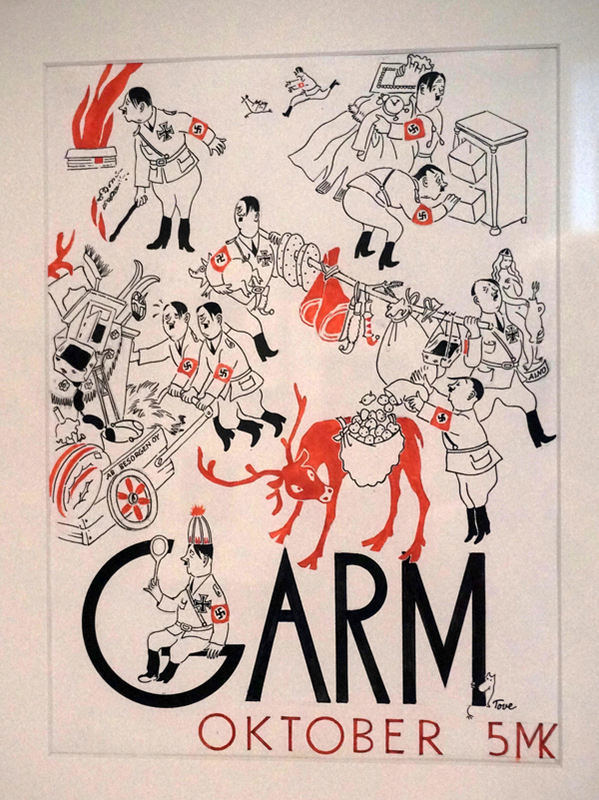 Garm was a liberal Swedish-language political journal published in Finland. 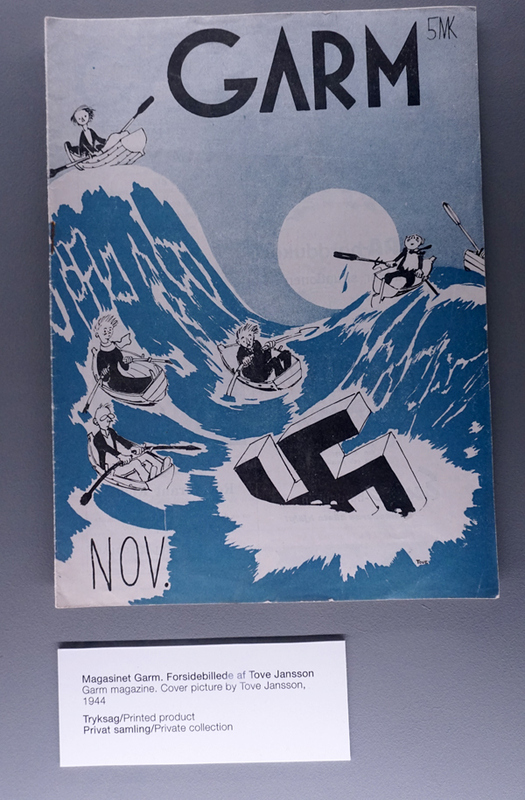 At the time, her covers and illustrations for the magazine were nothing short of audacious. 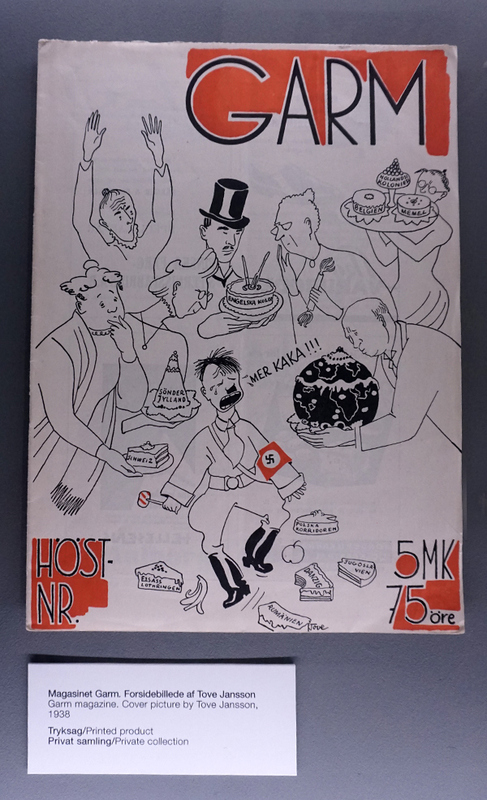 In her satirical anti-war illustrations Tove Jansson mocked Hitler and Stalin equally. She was a very brave woman(!) 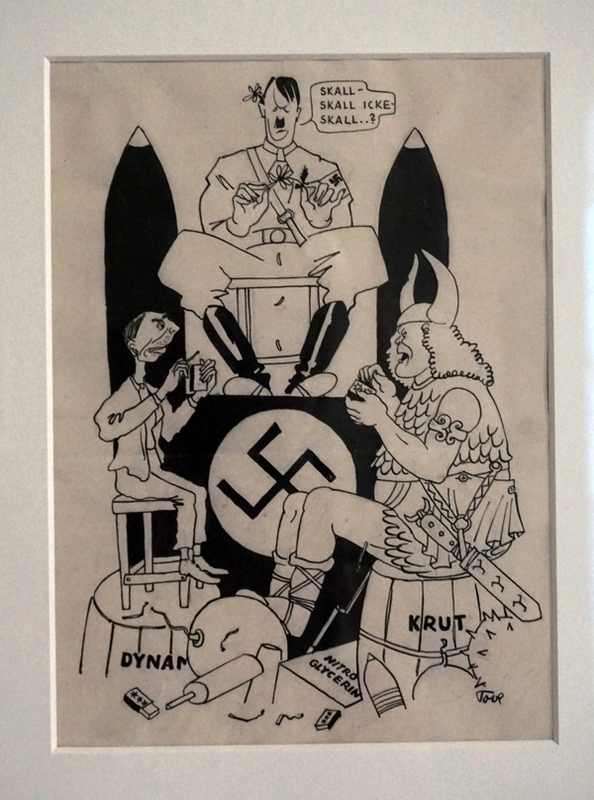 Her drawings were also well known in Sweden, where in 1941 she was voted the most humourous cartoonist in Scandinavia. Towards the end of the war Tove started writing and illustrating the books about the Moomins and in the 50’s, she drew a mumi strip for the English news paper, The Evening News. This and her childrens books about the daily life of the Moomins were to earn her money and fame for the rest of her life: the Moomin books have been translated into more than 40 languages; she received the Hans Christian Andersen Medal in 1966 for her contribution as a children’s book author and everal stage productions have been made from her Moomin series, including a number that Tove herself was involved in. The earliest production was a 1949 theatrical version of Comet in Moominland performed at Åbo Svenska Teater in Finland. In the mid-50s Tove met her wife Tuulikki Pietilä (1917-2009). Tuulikki was a Finnish graphic artist and professor, born in Seattle, Washington, United States. Tuulikki Pietilä was one of the most influential people in Finnish graphic arts, and her work has been shown in numerous art exhibitions. She worked as a teacher in the Academy of Fine Arts, Helsinki, for many years. Tove and Tuulikki lived together until Tove’s death in 2001. The exhibition hall Gl. Strand screens Moominland Tales: The Life of Tove Jansson (BBC, 2012, 60 minutes) and Mumi-historier (Mumitrolde, Den herlige mumifamilies eventyrdagbog, Kometen i Mumiland), a short film in Danish about the Moomin books. 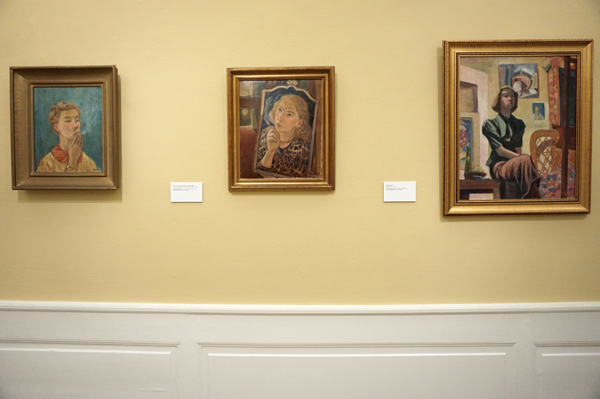 The exhibition is created by Ateneum Finnish Art Gallery in co-operation with Kunstforeningen GL STRAND. A richly illustrated catalogue about the exhibition has been published. This catalogue is published in three editions (English, Danish and Swedish). Biography Tove Jansson: Life, Art, Words by Boel Westin – review by Sue Prideaux, The Guardian.